Once upon a time, a group of mice were living happily under a tree in a forest. 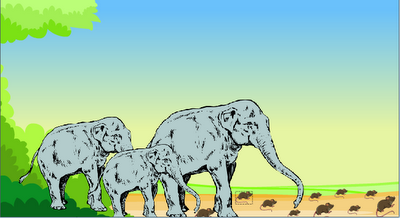 On a sunny hot day, a group of elephants, in search of water walked through the area where the rats were living. 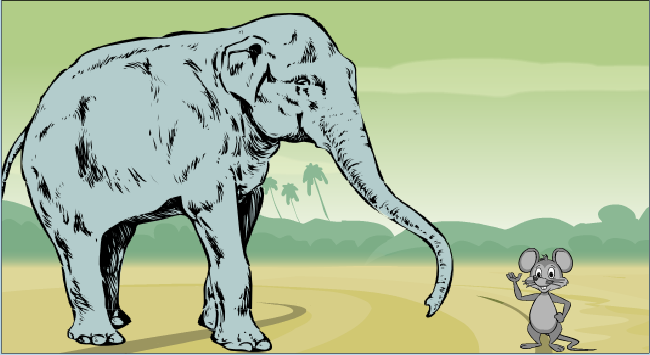 As the elephants walked, they destroyed the homes of those rats and even killed some of them. The rats ran to the king of the rats for help. The king of the rats went to the chief of those elephants and requested them to go through another alternative route to the pond. The chief of the elephants accepted the request of the mice and asked the other elephants to go in the other way, without disturbing the rats. The king of the rats was very happy and pleased by the gesture of the chief of the elephant. He thanked the elephants and promised that in return the rats will surely help the elephants when needed in the future. Hearing what the rat said, the elephants laughed thinking how come a small rat help big elephants. After few months, on another pleasant day, when the rats were playing they heard a loud shouts of elephants coming from the direction of the pond. The king of the rats realized that the elephants are in some danger. He asked some of the strong rats in his group to come along, and went in the direction of that sound. Near the pond, they saw the elephants being captured in the traps kept by some hunters. 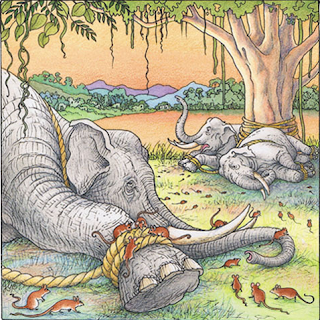 The rats quickly started biting the ropes and soon the elephants were set free. The elephants thanked the rats and also apologized for making fun of their appearance on the other day. MORAL : Never under estimate anyone with their appearance.